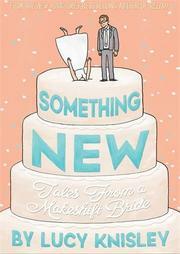 A newly wedded comic artist shares her experience, by turns hesitant and enthusiastic, planning the big event. Alex Award winner Knisley (Relish, 2013, etc.) offers another genial and creative graphic memoir. This one chronicles her handmade—down to the veil and groomsman’s pocket square—wedding. After what feels like an irreconcilable difference of opinion concerning procreation, a complicated separation, some time in relationship limbo, and a wholehearted subway sob, Knisley finds herself engaged to John, a kind and sincere man whom she loves deeply. With this engagement comes a breadth of unexpected feelings—excitement, reluctance, confusion—a tumult which Knisley terms “emotion sickness.” She asks herself hard questions about participating in what she has previously felt is a sexist and antiquated ritual which promotes exclusion, wondering “How can something so universal and ubiquitous as a wedding alter a person’s perception of herself so much?” With honesty and humor, Knisley tackles such difficult topics as overbearing mothers-of-the-bride, the misery of the “dress safari,” the “bridal weight loss imperative,” making the wedding her own artistic accomplishment, and dead squirrels. She documents in a self-expressive and clever style as she learns the compromise that comes with weddings, marriage, and love. Like her wedding, Knisley’s book is introspective and inventive; the illustrations are charming, the language clear, and the sequence coherent. At once universal and deeply personal, this book is a visual and emotional achievement.